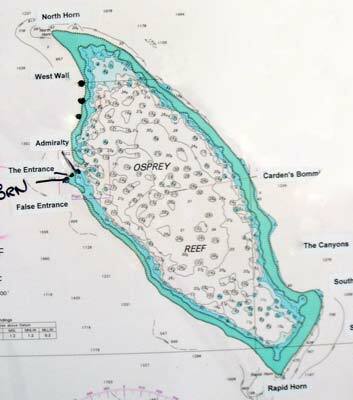 North Horn is the very northern point of Osprey Reef. The GPS Reading is S13° 48' 05.2" E146° 32' 45.7" using WGS84 as datum. It is approximately 320 kilometres from Port Douglas. The location obviously gets its name from the shape of the reef which from the air looks like a horn on a unicornfish or similar. There are two sections of reef to follow. One is the western side and the other is the northern side. There is a mooring on a bommie in about 12 metres of water at the above GPS reading. Behind the bommie there is a sort of amphitheatre (more about this later) and behind that a largish overhang and swim-through. More about this later as well. From the boat drop to the sloping sandy bottom. 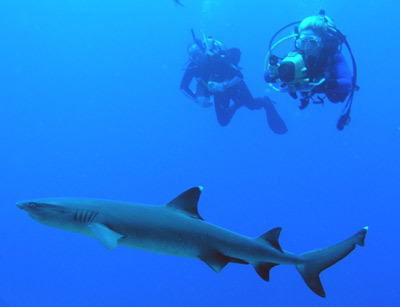 As you you descend, look out for the many sharks that you will see on this dive. Once on the bottom, head to the south. Soon you will see that the reef drops from the shallow five metres in an almost vertical wall for 20 metres or so and then in a steeply sloping wall to about 40 metres. From here it drops to over 400 metres. Follow the wall at about 35 metres to start and start a very gradual ascent. 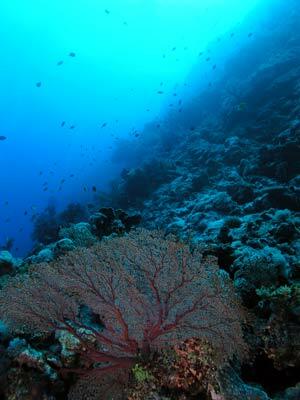 There are some fantastic gorgonias, soft corals and coral whips. You can take some excellent photographs all along this wall. Look out to the open water as you go and you will probably see some sharks (white-tipped reef mostly, but also grey whalers and silver tipped). The wall has numerous overhangs and back cuts. 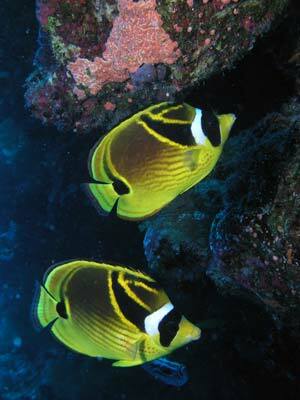 These are home to soft corals of all colours. The yellow and orange ones are the most attractive. 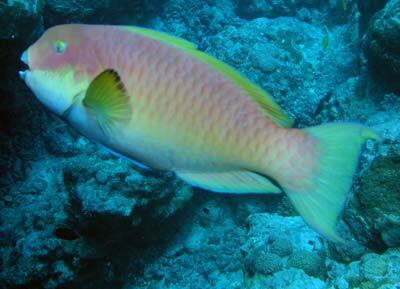 There are lots of coral trout all along the reef. They are mostly near the top of the walls but some are deeper. They are not like the normal coral trout that are red or orange, these ones are black with white band across their middle and some white spots on other parts. You may also see some pelagis species. When you have used up half your air or bottom time, turn around and head back towards the mooring. Keep coming shallower as you go. 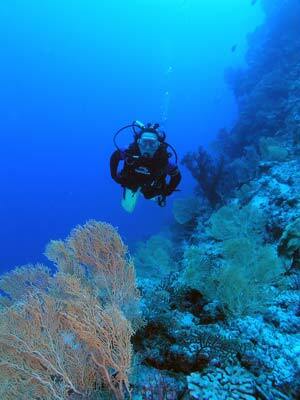 There are more soft corals and some very large gorgonias. When you get back to the mooing area, examine the swim-though to the south-east of the mooring (mentioned at the start of the article) and look at all the walls of the bommies and main reef. There are some anemones and clownfish, some nice painted moray eels (I found an extremely friendly one in 2006) and more. 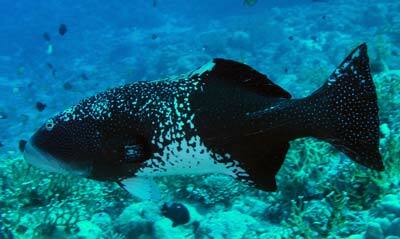 I have two other dive descriptions for this location, see North Horn Shark Dive and North Horn Drift Dive. Visibility here is nearly always at least 40 metres.